Celebrate New York, take a seat and enjoy the show all summer long! Enjoy the many benefits of SummerStage Membership and support New York City’s premier performing arts festival. Celebrate who you love now. Discover who you’ll love next! Support City Parks Foundation with a SummerStage Membership. Enjoy incredible experiences with exclusive benefits, and feel good knowing that you’re supporting free performances all around the city. Memberships begin at $150 and include express entry and reserved bleacher seating. 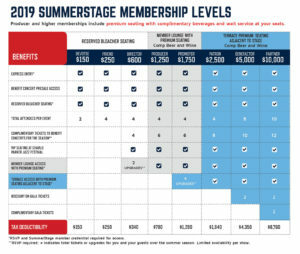 Higher level privileges also include new Stage Right Skybox premium seating adjacent to the stage, Member Lounge Access with new rooftop deck, complimentary beverages, and wait service at your seats. 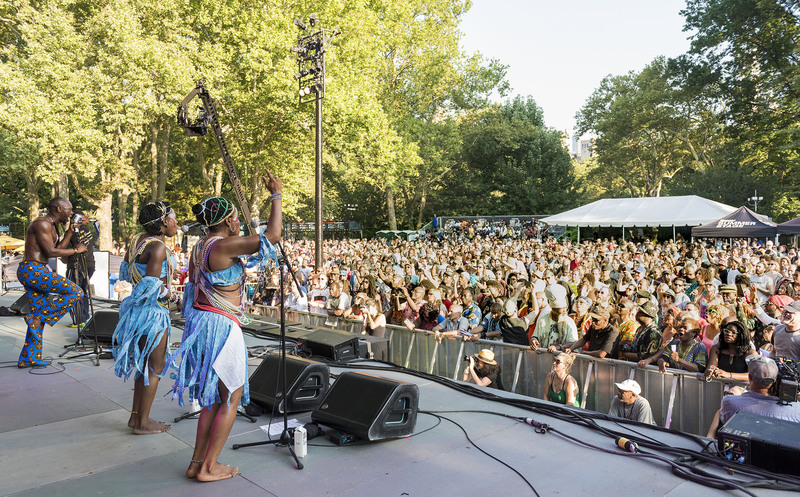 Whether your passion is for indie rock, reggae, contemporary dance, or anything in between, we invite you to become a member, support our programs in parks and celebrate with us as we bring local and global artists together at SummerStage. Past SummerStage seasons have featured Trey Anastasio, Gregory Porter, Trombone Shorty, Rhiannon Giddens, Elvis Costello, Talib Kweli, Patti Smith, Mavis Staples, Taj Mahal, La India, The War on Drugs, Muse, Kyle Abraham and Movement of the People, and many more. Email Membership@CityParksFoundation.org with any questions. SummerStage is a program of City Parks Foundation, a registered 501(c)(3) organization, and your membership is deductible to the full extent provided by law.